Lancashire's iconic home will host six ICC Men's Cricket World Cup 2019 fixtures, including a semi-final. 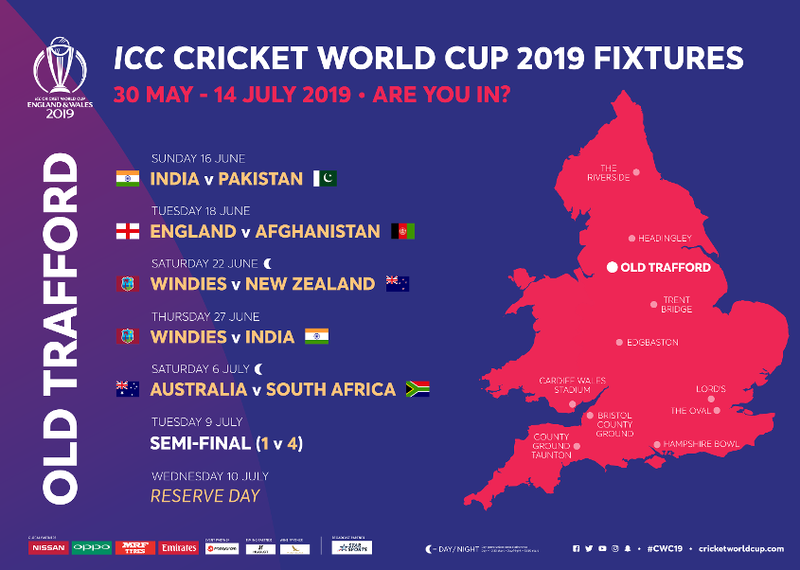 Old Trafford, home of Lancashire County Cricket Club, will be the busiest venue at next year’s ICC Cricket World Cup 2019, as it will play host to six games, including a semi-final. It also will be the venue for the most-watched fixture in international cricket when India take on Pakistan. The ground itself is no stranger to World Cup cricket having been used in the 1975, 1979, 1983 and 1999 editions of the tournament. England have played two Cricket World Cup semi-finals at Old Trafford, beating New Zealand by nine runs in 1979, but losing to India by six wickets in 1983. The ground itself is the second oldest Test venue in England, hosting Tests since 1884, and recently renamed their Pavilion End the ‘James Anderson End’ after England’s leading Test wicket-taker. To find out more about the accessible facilities and services at Old Trafford, check out the CWC19 Access Guide here. Plan ahead so you can make the most out of your day at Old Trafford during the ICC Cricket World Cup 2019. Old Trafford is located in the borough of Trafford, only 3 miles from Manchester city centre and is well connected by local tram and bus services if you want to leave the car at home. Old Trafford tram station is located right beside the cricket ground and provides the easiest and most direct link to the ground. Journeys take around 15 minutes from Manchester City Centre with four stops within easy walking distance of the ground. Services to Old Trafford provide a direct link to Piccadilly Station and Victoria Station. You must have a valid ticket before you board a tram. Please be aware that ticket checks take place across the network. 12 minutes from Sale Water Park to Trafford Bar Station and a short walk (0.6 mile) to the ground. 28 minutes from East Didsbury to Old Trafford. 30 minutes from Ladywell to Old Trafford. Old Trafford does not sell any match day parking on the venue however there are a number of car parks which are located near to the ground. The official car parking is located at the Manchester United Football Ground. Vehicles will be directed to N3 – the North Car Park which is located off Wharfside Way. Blue badge parking can be booked directly through Lancashire County Cricket Club. Booking information coming soon. Currently, the 53, 79, 250, 255, 256, 263 and x50 bus services all run within a short five minute walk to Old Trafford. Bus operators will always have the latest information about their services. Follow them on Twitter or get their contact details in advance @stagecoachGM, @arrivanorthwest, @diamondbusnw and @firstmanchester. If travelling to Manchester by rail we recommend to arrive into Manchester Piccadilly Station or Victoria Station and connect onto a Metrolink service to Old Trafford. If you are local to the area, walking is a great way to get around. World Cup Cricketeers will be along the route to help answer any questions and guide you to the ground! Birthplace of the computer, the Football League and Northern Soul, Manchester’s heritage is rich and diverse. The industrial revolution which was instigated by Manchester’s first steam-powered mill, shaped the world’s economy. Manchester is famous all over the world for its sport; Trafford Borough, in Greater Manchester, is home to Old Trafford Cricket Ground and the city has two world-famous and iconic football teams, Manchester City and Manchester United and boasts one of the world’s finest and fastest board tracks, The UK National Cycling Centre. The city centre is jam-packed with unique and eclectic restaurants, bars, shops, museums, galleries, hotels and places to stay whilst the surrounding Greater Manchester boroughs offer a patch-work of visitor experiences including quaint market towns, traditional pubs and beautiful green spaces and waterways to be explored on foot or bike. Furthermore, a packed calendar of world-class events and festivals including the Manchester International Festival, next held in July 2019, means there’s always another reason to visit the city. Manchester is the perfect gateway to the north, with inspiring cities, including Liverpool, Chester and York and the natural beauty of the Lake District, Peak District and Wales, all a stone's throw away.